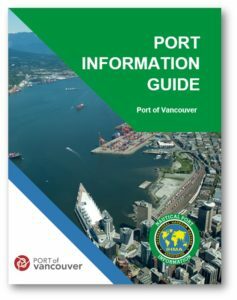 The Port Information Guide contains a set of localized practices and procedures designed to promote safe and efficient navigation within the waters of the port and support efforts to protect the marine environment. Practices and procedures at the Port of Vancouver are pursuant to Section 56 of the Canada Marine Act and are designed to promote safe and efficient navigation within the local waters of the port and to protect the marine environment. The practices and procedures apply to all vessels in the port, including pleasure craft and recreational vessels, as well as other users of the port, including tenants. If you have comments about the content of the Port Information Guide, please contact us directly by email. The practices and procedures govern a dynamic marine operations environment and are updated regularly to reflect international best practices. Under normal circumstances, notice will be given as far in advance as practical but will be no less than thirty (30) days. An emergency amendment may be made to these practices and procedures without notice. Subscribe to our marine operations email list to be notified of amendments.